Associate Professor Karl Sammut, director of the Centre for Maritime Engineering, Control and Imaging at Flinders University at Tonsley. Image via Flinders University. 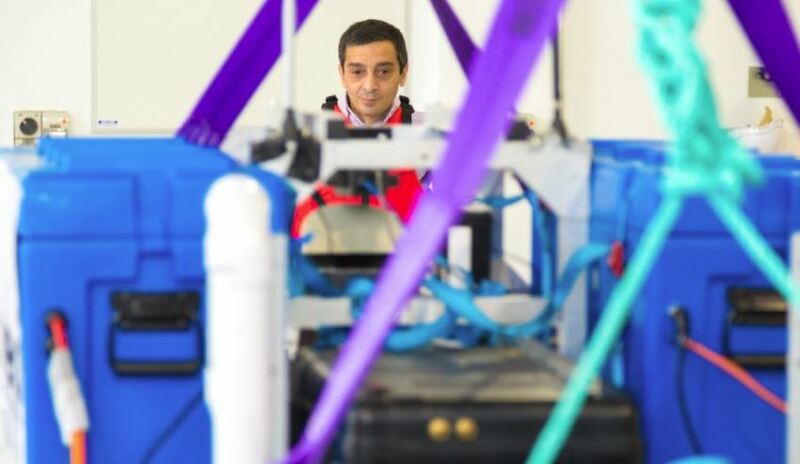 A new project that will enable autonomous underwater vehicles to launch and recover themselves without the need for human involvement has taken out the inaugural Fincantieri-Flinders-CETENA Maritime Innovation Challenge. The winning entry was announced at an Adelaide ceremony attended by the Italian Minister of Foreign Affairs Angelino Alfano. The successful project will now receive $310,000 from Fincantieri Australia to further their research. The Maritime Innovation Challenge was pioneered by global shipbuilder Fincantieri in collaboration with its Italian maritime research subsidiary CETENA and Flinders University to foster international research collaboration among engineering minds and help advance Australia’s sovereign defence capability. The challenge was officially launched at the Pacific 2017 International Maritime Exposition in Sydney in October this year and attracted a range of high quality submissions from Flinders University researchers. Organisers said competition for first place was tight, with research proposals spanning a number of priority areas in maritime innovation including maritime manufacturing and materials science and technology. "The quality of the submissions made to the Maritime Innovation Challenge have demonstrated the strength, capacity and global industry relevance of the naval research currently taking place at Flinders University," said president and vice-chancellor of Flinders University Professor Colin Stirling. "This research spans autonomous vessels for maritime surveying and mine detection to harnessing fibre-optic technology to detect noise and damage on ships. "The challenge has also given Flinders the chance to take its world-class innovations in naval shipbuilding and defence to a global market through Fincantieri, and make an impact on a rapidly evolving sector." Lead researcher of the winning project associate professor Karl Sammut said that the funding received from the Maritime Innovation Challenge will allow his research team to innovate a new intelligent guidance system for autonomous underwater vehicles that may have applications across the naval, research and commercial sectors. The winning project team will collaborate with researchers from the University of Genoa, further strengthening the synergy between Australian and Italian maritime researchers, Fincantieri Australia chairman Dario Deste said. "Fincantieri is delighted to support growth and innovation in the maritime industry by providing Flinders University a platform to apply its exceptional research to the naval challenges of the future," Deste said. "The Maritime Innovation Challenge builds on the productive relationship that Fincantieri enjoys with Flinders University and provides a fresh platform for us to work together on developing maritime capability by addressing the technological and environmental challenges we face." Fincanitieri is one of the three international primes tendering for the $35 billion Future Frigates project. The project will see the winner design, build and sustain nine new anti-submarine warfare frigates to replace Australia's Anzac frigate fleet.